– Data quality and integration are big challenges to the promotional cycle. This manifests itself particularly in the areas of post event analysis, gleaning macros insights, and performing predictive analytics about promotions. In the 2018 POI survey, 80% of respondents stated that they do not have issues with integrating 3rd party data such as POS. We continue to see a strong correlation between companies that are satisfied with their promotions and their ability to bring external data into the process. While many TPx offerings include data management, many do not. This is a key differentiator in vendor support and, ultimately, in the quality of promotional outcomes. – There is modest differentiation among TPM solutions at the trans-actional level for planning and executing promotions. What differentiation there is typically can be found in the user experience and ability to evaluate promotions before and after they are executed. Greater differentiation can be found in the ability to predict promotional outcomes and generate insights to improve the overall promotional cycle. – TPx is becoming more of a subset of emerging revenue growth management (RGM) initiatives. We applaud this trend and the role of these types of analytics across multiple disciplines within CG. – Artificial intelligence (AI) has considerable interest among vendors, and we are beginning to see instances where it is being brought to bear in a way that impacts promotions and promotion effectiveness. We believe that AI has tremendous potential and look forward to it having a greater impact in the future. – More solution options exist than ever before. In this report, we have evaluated a total of 23 vendor solutions. We continue to see more “localized” solutions that focus on specific geographies such as Europe or North America. We have not seen any consolidation among vendors in the last year, which is largely a good thing for users of these solutions because of the tendency to force adoption due to unsettling of technologies or merging of platforms. – Deeper analytics, better user experience, and capabilities for optimizing promotions through predictive models are key differentiators that are highly sought after. We consistently see this in case studies of success. – Post event analysis is often overlooked or an afterthought when considering the entire trade promotion cycle. However, we have seen this addressed more recently as either something requiring a specialty tool or as having higher weight in the selection process. 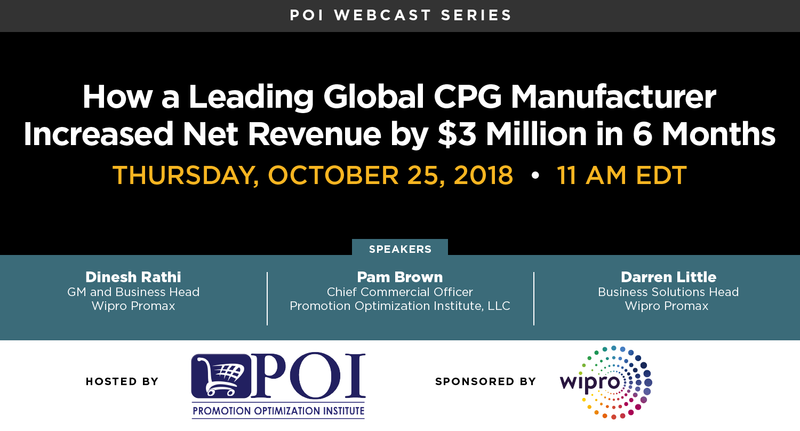 Because most CG companies are only able to evaluate the top 2-3 promotions at their key 5 vendors, you have an opportunity to gain a competitive advantage by evaluating a greater number of your promotions. Access the complete report here! Prepare for POI Dallas by attending this week’s complimentary Webinar on Thursday, October 25 at 11AM EDT. Attendees will get a first look at impressive early results of the 2018/2019 POI TPx and Retail Execution Survey, with Pam Brown!